We wanted to give everyone a quick update on some changes to the Spinpod mount for our Dolly System. Previously we showed a prototype mount that consisted of a curved aluminum rod. We have been working on a more elegant design and just received it from our 3D printers. What do you think? It is a simple design that looks and works great! It also gives even more room to mount large cameras and lenses. It is important to note this is still a 3D printed prototype, our final production run will be made out of CNCed aluminum and black anodized. We think it looks especially good with the all black Spinpod. We also have the option of making an all red Spinpod mount if enough people are interested. 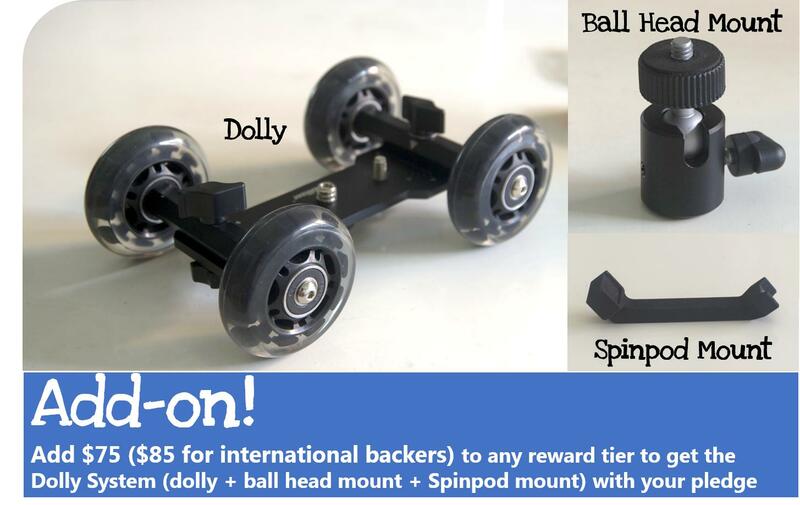 Remember there are just 4 more days to add the Dolly System for $75 ($85 for international backers) to your pledge. You can also add extra Spinpods as gifts for $59 each. We currently do not have finalized plans for retail or future pre-orders so make sure to order everything you need before our project ends. Thanks! Hey just wandering do you know makayama ipad case for taking pic and video inhave one and i wonder can the case fit in this dolly? The Dolly System is designed to work with pretty much all DSLRs. I am sure there are some exceptions out there but everything one we have looked into and tested have worked great and the Canon 5D is no exception! Some really huge lenses won't works since they will shift the center of mass too far off the base of the dolly but this shouldn't really be a concern since most time-lapse is shot with shorter lenses. The SPINPOD POWERED DOLLY SYSTEM is mainly meant for time-lapse shots but will also work for regular video shooting at the highest speed setting. You can also disconnect the Spinpod and manually move the dolly when recording regular videos. Let us know if we can be of any more help. Thanks! Would this work with any DSLR?. I have a canon 5D. Can it work for pictures on a timelapse sequence and video? Different dollies have different wheel size, mounting bolts, and wheel locations. Because of these differences the Spinpod mount for the Dolly System only works for 1 specific type of dolly. This means that currently, if you want to be able to use a dolly with your Spinpod, you will need to order the whole system. This is pretty cool! I already have a Dolly like this but would need the other two pieces, what should I add to my pledge?